Paneer Butter Masala is one of the favourite at my home, which I prepare often. Do checkout my recipes Tomato Paneer, Mutter Paneer, Palak Paneer, Pepper Paneer, and many more varieties previously in my Paneer recipes here. Soak paneer cubes in warm water. Chop onion and tomato to medium size cubes. In a Kadai, put little oil and spices, half the chopped onion, tomato and garlic. Saute till its soft. Allow it to cool and grind to a fine paste with little milk. I sometimes do a coarse paste. Add grounded paste with little water. Add salt to taste. Keep it in low flame. Keep Stirring. Once its cooked well, tomato puree and allow one boil. Then add milk, mix and boil it. Add all masalas and mix well. Keep it in low flame. Once its boiled, check for salt and add paneer and mix well. It should be not too thick or too runny. Just semi gravy and blend well. Add sugar and stir well. You can also add a pinch of kasoori methi. Allow it to boil once and off the stove. Add 1 tblspn of butter on top and off the stove. Top it up with cream if you like or serve just like that. I have served with Phulkas. Paneer Butter Masala is ready to serve. This can be a side dish for Chapathi, Naan, Kulcha and Rotis (Indian Breads) or Pulao. 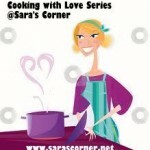 This recipe is going to Cooking with love Sister by Ruchika and Saraswathi Iyer.